What might have been the most famous words ever written about the Enlightenment go like this: “Aufklärung ist der Ausgang des Menschen aus seiner selbstverschuldeten Unmündigkeit.” The problem, however, is that the author of these words — Immanuel Kant (of course!) — wasn’t trying to answer a question about a period in history (i.e., “what is the Enlightenment?”) but was instead trying to clarify what was involved in the process or activity known as Aufklärung. This has become a particular hobby horse of mine. It strikes me that, the moment we start to think that Kant was engaged in an effort to define what “the Enlightenment” was all about, we lose track of what was going on in 1784 and what happened over the course of the next couple of centuries. For Kant and his contemporaries, “enlightenment” denoted a set of projects and practices. 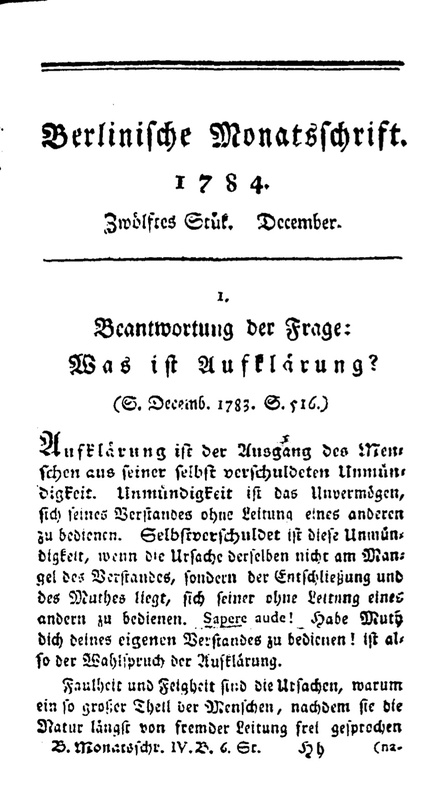 By 1784 there was considerable confusion as to what counted and what didn’t count as a contribution to the “enlightenment of the citizenry.” Hence the question that Kant, along with many others, was attempting to answer in the flood of articles on the question that filled German periods over the next few years. To assume that these articles were an attempt to capture central features of a particular historical period prevents us from understanding just how confused people might have been around 1784 about what was and what wasn’t “enlightenment” and how long it took for these confusions to be replaced by a new set of confusions: disputes about what the historical period now known as “the Enlightenment” was all about. I think these two sets of confusions are related, but I’d like to keep them separate, if only to prevent yet more confusion. In looking at what Kant and his contemporaries were doing, I think it is essential that we realize that it is not the job of historians to resolve other peoples’ confusions — this is what philosophers do, when they’re not helping flies out of fly bottles. There’s nothing wrong with this (though I’d prefer that the flies stay in the fly bottles), but even those who are concerned with trying to resolve past confusions need to get clear on just what it was that earlier thinkers were confused about. It was in this spirit that, a couple of decades ago, I edited a collection of translations of a few of the German discussions of the question “What is enlightenment?” along with some later discussions of the controversy from the 1780s and subsequent attempts to answer Kant’s question. There were, after all, a lot of responses to the question besides Kant’s and it seemed to me that some of them — notably Moses Mendelssohn’s — were interesting in their own right. Others were useful in clarifying what seemed to be at stake in the debate and helped to understand Kant’s particular concerns (e.g., I think it helps to know that a fair amount of ink was being spilled at this point about issues involving the freedom of the press). My one regret is that I didn’t include the two essays from the Berlinische Monatsschift that prompted the question to what which Mendelssohn and Kant responded: Johann Erich Biester’s article questioning whether clergy were required at wedding ceremonies and Johann Friedrich Zöllner’s response to Biester, which included the famous footnote that launched the discussion. At the time when I was putting the collection together it wasn’t clear (at least to me) just how important and interesting disputes about the concept of marriage were about to become. The closeness of Richardson’s English to Kant’s German serves as a reminder that the vocabulary of the German enlightenment was not entirely foreign to translators like Richardson. According to Kant’s disciple Ludwig Heinrich Jakob, Richardson had studied Kant’s work during a stint at the university of Halle and two of his letters to Kant, written while he was living in Altenburg have survived.1 A few weeks ago it occurred to me that it might be mildly enlightening to slap together a blog post that would look at some of the ways in which the opening lines of Kant’s essay has been translated and see what might be said about them. I figured that, using Google’s Ngram Viewer, I could track the history of the various words that translators used and, perhaps, draw some enlightenment from this exercise. Rather quickly, though, what I was doing became too big (and too time-consuming) for a single post. So what follows will be the first of a series that moves, word by word (well, not every word) through the opening line of Kant’s response and explores the choices that different translators have made and what their choices might illuminate about the words, and the world, we have lost (think of it as my equivalent of making every recipe in Mastering the Art of French Cooking, except that it won’t take too long and will be much healthier). Enlightening is man’s emergence from his self-imposed nonage. Enlightenment is man’s release from his self-incurred tutelage. H. B. Nisbet in H. Reiss, Kant’s Political Writings (Cambridge University Press, 1970). Enlightenment is our release from our self-imposed dependence. Enlightenment is mankind’s exit from its self-incurred immaturity. Enlightenment is the human being’s emergence from his state of self-incurred minority. Mary J. Gregor, in Kant, Practical Philosophy, (Cambridge University Press, 1996). Enlightenment is the human being’s emancipation from its self-incurred immaturity. And then there’s Menschen, which is probably the choice that has been most influenced by contemporary patterns of usage: up until 1983, everyone used “man’s,” then things became more complicated. Rauch and Anderson tried to avoid the issue of gender specificity by using “our,” which has nothing to recommend it, as far as I can see. Gregor, along with Colclasure and Kleingeld went for “the human beings.” And I, unrepentantly, used “mankind,” since anything else struck me as anachronistic (I made amends by following it with the neuter possessive “its”): there is every reason for us to avoid gender specific language when speaking of the species as a whole, but no reason at all to pretend that this was something that Kant or other male eighteenth-century writers would have done (like historians, translators are not in the business of getting flies out of fly bottles). So, here we are: nine English translations and five German words. I hope to have something up about Aufklärung (including some tasty Ngrams) later this week. This entry was posted in Uncategorized and tagged Kant. Bookmark the permalink.